Prime Minister Narendra Modi had promised during the 2014 election campaign that he would bring back the black money stashed abroad by Indian citzens after coming to power. The Modi led Government’s report card on this count draws a blank and people have started asking questions. A lot has already been analysed and written by experts on Foreign Investment in India and the Mauritius connection. 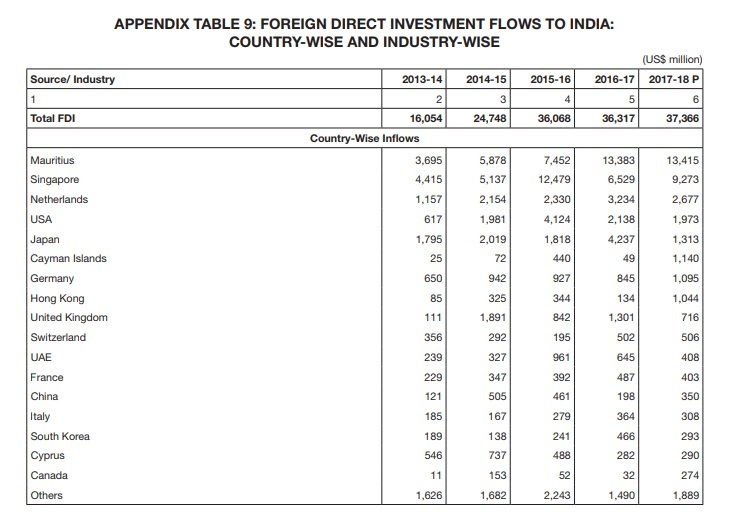 A particular piece of information available through the latest Annual Report released by Reserve Bank of India on Wednesday (29 August 2018) underscores that Foreign investment into India by companies that took the Mauritius route has surpassed all other channels during 2016-17 and 2017-18. Taking the record smashing investment from Mauritius at face value, nothing appears to be amiss since money was invested in India by companies legally registered in Mauritius that took the benefit of the Double Tax Avoidance Agreement between India and Mauritius. This agreement provided for tax exemption to the foreign investors who were exempted from paying Capital Gains Tax arising on sale of shares of an Indan company till March 31 2017. India’s treaty with Mauritius has been revised from April 1, 2017. Under the reformatted agreement, companies routing funds into India through Mauritius will have to pay short-term capital gains tax at half the rate as applicable during the 24-month transition period. The full rate of 15%, now applicable will apply from April 1, 2019. The legal position notwithstanding, the enforcement authorities in India are aware of the benefit drawn by corrupt elements, smugglers and big time mafia within the country, who started following the Mauritius route to convert black money into white after India entered into the Double Tax Avoidance agreement with Mauritius. Fly-by-night companies shown as running small time enterprises got registered in Mauritius. All kinds of unscrupulous elements, even politicians, it is said, invested in these companies. According to knowledgeable sources, cash or black money was physically transferred to these companies and shown as profit and the money invested in this way became white on payment of 1% tax on it in Mauritius. After this the Mauritius based companies invested in the Indian stock market by giving funds to Indian companies. A year later, this money was withdrawn and there was no tax liability on it since the Long Term Capital Gains Tax was 0% under the Indian law till recently. This money was then routed back to Mauritious and the tax avoidance business on the basis of the bilateral Double Tax Avoidance Agreement continued to flourish. In the process people stopped stashing black money abroad when they had the freedom to follow the Mauritius route. With the revised treaty between India and Mauritius now in force, the round tripping should stop. This analysis is based on data provided by Reserve Bank of India. It focuses on the modus operandi of those who could use the Mauritius route to convert black money into white. Newsroom24x7 has taken up this issue in public interest and it is for the enforcement authorities to go to the root of the problem and address the issue in its entirety.